ALGO-BOT Fishing Cactus pour Techno.bel (Belgium), Grâce au financement du Fonds social européen (Belgium), 2013 Download it Now ! Algo-Bot is a Serious Game for learning logic programming without addressing the material so daunting . Here, no code, no theory , no language but icons to everyone, while putting your brain buzzing and obviously having fun first. Do you plan to in the future. Humans still do not know what to do with their radioactive waste . To avoid contact with hazardous substances , small robots were created and now inhabit the plants. They must sort, move , manipulate, in a word, perform all tasks necessary for the operation thereof . Help the little Algo achieve its mission. In this universe evolves little robot Algo , and it is you who take control ! You must make him realize a number of simple actions with the help of a control panel : go straight, turn right, turn left. Helped ( e) by Tina, the mechanical engineer -in-chief , you grow with the increasing complexity of Algo tasks. This under the inquisitive gaze of the Director, who will ensure that you are always the / most efficient possible! A good dose of serious fun in a shell ! But once caught ( e) and driven by the challenge (s) the dynamic , what do you take apart the entertainment? 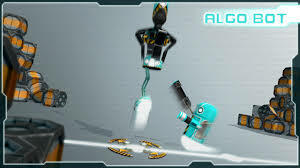 For Algo -Bot is a SeriousGame , and if the " game" obvious aspect, the serious side is more subtle ! Indeed, while playing, you play without knowing the basic logic of software development . By programming control sequences , you unconsciously integrate development concepts such as variables , functions, conditions, groups, etc. .